2019 LIMESTONE RODEO DETAILS ARE UP! RODEO RULES THIS YEAR HAVE CHANGED! The Limestone Rodeo 2019 is a red-point competition with some fun rodeo-themed bonuses. 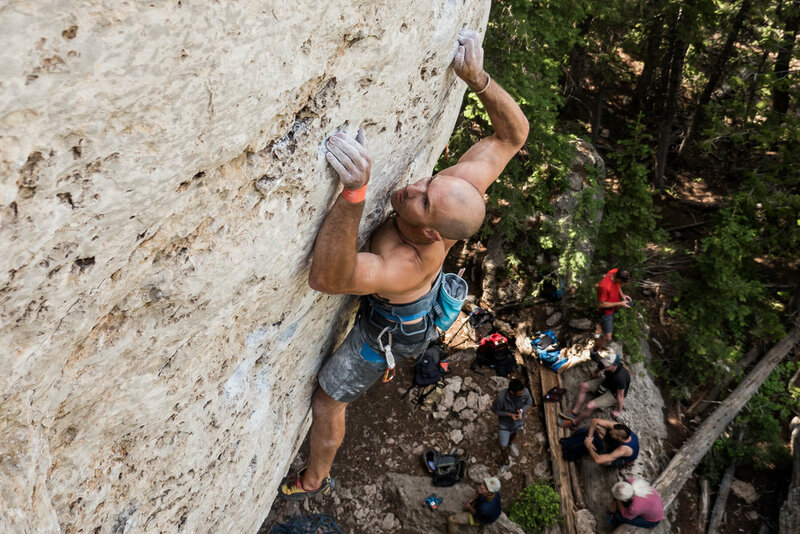 Competitors are only allowed to climb routes that are in the 2019 Rodeo Hall of Fame, a list of 100 2-3 star routes. Point values are assigned to each route, roughly based on grade but with some added twists. It is a partner competition where partners much match each other pitch for pitch but not route for route. Up to the top 10 routes in terms of point value will be counted for each partner towards the team total. Bonuses must also be matched by partners to count towards the team total. Routes can be “double-dipped”, i.e. used for the main top 10 and for applicable bonuses. Each category (Open, Advanced, Intermediate) will have three team winners. There will also be an overall individual winner of the entire Rodeo based on total points (top 10 routes plus any bonuses achieved by that individual, regardless of if partner achieved them). Only the routes and walls on the 2019 Rodeo Hall of Fame List count for this competition! Routes must be red-pointed to count. (This means no falls or hangs or aiding of any kind, and anchor must be clipped!) Be honest. You must use the official score card during the competition and turn in the one you used - no exceptions! The score card will be available at ICF registration, the WyoClimbers booth, and on Saturday morning during the pre-rodeo roundup meeting. All competitors need to be at the Saturday morning pre-rodeo roundup meeting at Wild Iris Main Wall parking lot at 7:30 am. Breakfast will start up there at 7, so you should have time to eat some pancakes and bacon, glug some coffee, and get organized. The Limestone Rodeo ends at 4:00 pm. All score cards must be turned in at the WyoClimbers info booth at the Wild Iris Main Wall parking lot by 4:00 pm. No exceptions! Competitors need to tally their own points carefully. We are asking that you sign your score card beneath your name to verify that information is correct and honest. Cheaters will be tarred and feathered and forced to run back to Lander.